The tawny nurse shark (Nebrius ferrugineus) is a species of carpet shark in the family Ginglymostomatidae, and the only extant member of the genus Nebrius. It is found widely along coastlines in the Indian and Pacific Oceans, preferring reefs,sandy flats, and seagrass beds from very shallow water to a depth of 70 m (230 ft). 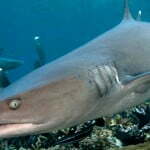 With a cylindrical body and a broad, flattened head, the tawny nurse shark is quite similar in appearance to the nurse shark (Ginglymostoma cirratum) of theAmericas, from which it can be distinguished by its pointed-tipped dorsal fins and narrow, sickle-shaped pectoral fins. The maximum recorded length is 3.2 m (10.5 ft). Nocturnal in habits, the tawny nurse shark tends to spend the day resting in piles of two dozen or more individuals inside caves or under ledges. At night, it is an active-swimming predator that uses a powerful suction force to extract prey from inside holes and crevices. The diet of this species consists mainly of octopus, though they also take other invertebrates, small bony fishes, and rarely sea snakes. It is aplacental viviparous, meaning the embryos hatch from egg capsules inside the mother. It is the only carpet shark in which the embryos are oophagous, feeding on eggs produced by the mother while inside the uterus. The litter size may be as small as one or two, based on the large size of near-term embryos. Compared to the nurse shark, the tawny nurse shark has a more placid disposition and will often allow divers to touch and play with it. 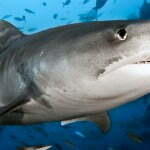 However, it should be accorded respect due to its powerful jaws and sharp teeth. 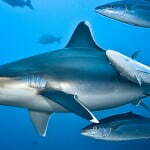 This species is caught bycommercial fisheries across most of its range for meat, fins, liver oil, leather, and fishmeal. It is also esteemed as a game fish off Queensland, Australia, and is known for its habit of spitting water in the faces of its captors. 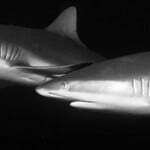 The International Union for Conservation of Nature (IUCN) has assessed the tawny nurse shark as Vulnerable, with subpopulations in several areas already diminished or extirpated. These sharks are aplacental viviparous, meaning that the eggs hatch within the mother where the pups are protected during the first weeks of their development before being expelled during birth. 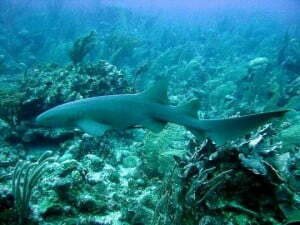 Nurse Sharks hunt principally at night when they leave their hiding places to forage for invertebrates and smaller fishes. Their mouth features fused tooth plates enabling them to crush crustaceans and shells.